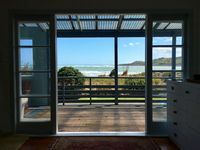 Properties in Ruapuke Beach average 4.5 out of 5 stars. 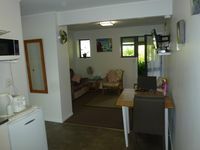 Property 7: Kent Homestay - Peaceful, secluded apartment with water views. Close to town. Property 25: Kauri Tree Retreat. Close to beach, surf and good coffee! Property 36: Absolute harbourside beach frontage, best views of the water. We received a warm welcome and helpful advice as to where to get a meal - we had arrived late. 'Monty's was wonderful for an easy waterfront walk into town. Comfy beds and spacious bedrooms.Very clean and tidy.